The suspension system of your vehicle consists of many parts, working in coordination to make your ride comfortable and safe. A properly functioning suspension system improves your control and handling of the vehicle, thus keeping you and your vehicle safe on bumpy roads. To ensure that your car stays in good working order, you need credible and expert auto suspension repair services offered by a prominent name in the Lakewood auto repair industry. At Lakewood Auto Body, we serve our clients with best in class auto suspension repair services, enhancing their safety and pleasure on the road. No matter how simple or extensive the auto suspension repair process is, it is perfection we strive to achieve in our every job. With our committed and dedicated approach, we assure our clients that their vehicle is in safe hands of proficient experts, who can take care of all the auto suspension repair and maintenance needs of your vehicle. Regular maintenance of suspension system is crucial and should not be overlooked. If ignored, the need for regular suspension repair services will pose a risk to your safety and can gradually add to your expenses, proving to be a costly affair. A poorly maintained or improperly functioning suspension system can cause immense difficulty in the handling of your vehicle. 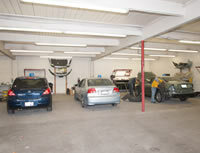 Timely auto suspension repair services can save you from such inconvenience and huge expenses. Ideally, the suspension and steering system of your vehicle should be checked after every 80,000 km or 50,000 miles. Lakewood residents can also look for signs like excessive noise, improper handling, unevenly worn tires, etc, which can indicate the need for auto suspension repair services. If you experience any issue in controlling your vehicle or handling becomes difficult, bring it to the trained and proficient technicians at Lakewood Auto Body for a complete diagnosis. There, you will get an immediate solution to rectify the issue before it can cause any more inconvenience. We employ the latest diagnostic tools to detect the problems and provide long lasting suspension repair services to our clients, ensuring their safety and peace of mind. To get timely solutions for all your auto suspension repair and maintenance needs, contact our experts at 253.581.0220 .